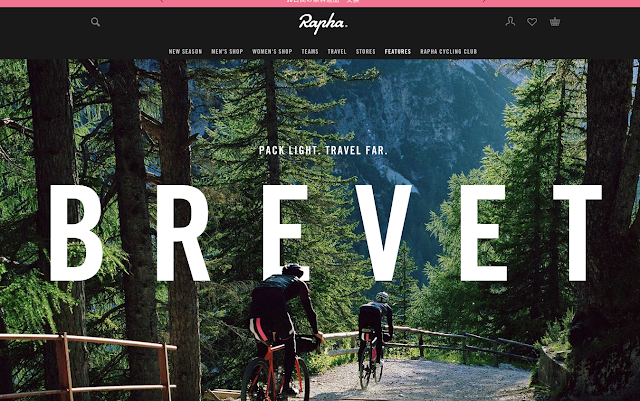 POSITIVO ESPRESSO: Rapha Brevet Collection? These words bring to mind activity that historically has been near the low end of the cycling style spectrum. I can remember the first time I saw a group of randonneurs on a brevet in Japan. I had just climbed up the South side of Yamanakako on Route 138 and was on the early part of the descent toward Gotemba on a very long hill. I saw a ragged line of cyclists grinding up the hill on the other side of the road, stretched out in small groups and singles. Their bikes were covered with odd stuff - large seat bags, congested cockpits full of lights, oversized GPS units, etc. Not the clean lines of a stylish road bike. And no Rapha clothing, nor Assos. Odd shaped bikes - some road, some mountain, some folding, all looking a bit grimy. From a road cyclist's perspective (not to mention a non-cyclist's perspective), a randonneur is a bit of an odd duck. Someone who rides in the dark, in the wet, and on a heavier, slower bike. The mental image is of an eccentric Brit (imagine an old Monty Python skit) standing at a crossing in the middle of some fields, fumbling with a compass, cue sheet and light in the dark. This is all changing, gradually. Of course, there are plenty of beautiful bikes on Audax events, though a beautiful Audax bike is likely to have a Brooks leather saddle and gorgeous steel frame rather than being a light carbon speed machine. Even a few beautiful people (?). And yes, there is Rapha clothing, and some Assos, Q36.5, and other stylish gear. The mythology of Audax -- the ultra long distances under sometime extreme conditions -- has found a broader fanbase in recent years. with Rapha features on PBP etc showing that it is an acceptable part of the Rapha mood video-defined, "genuine" hard man cyclist lifestyle. And if the comparison is Audax touring vs. "fully loaded" touring vs. mountain bike touring, then Audax is fast, sleek and stylish! The latest proof? This Rapha advertisement that was linked to an email in my inbox this morning. No, as the accompanying mood-setting video shows, these folks are not actually riding an Audax event. Just riding trails and roughing it in the South Tyrol / Dolomites to explore the area around the Messmer Mountains Museum, where we stayed on the pavement during the Giro delle Dolomiti last year.